In an age when information is everywhere, the challenge is finding safe, effective, and evidence-based science. Cue the National Strength and Conditioning Association, the world's leading organization in strength and conditioning. 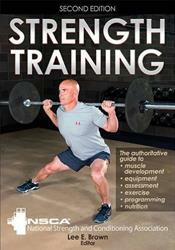 The first release of Strength Training redefined exercise instruction with no-nonsense, straightforward science. Now the new second edition raises that bar even further. Written by a team of experts chosen by the NSCA, Strength Training combines the most valuable information with best instruction for proven results.